The human aspect can often be overlooked in genres concerned with generation ship space battles, warring factions of angels, or titans of industry fighting for mining rights on the moon. When an author reigns in the trappings of science fiction and fantasy to make it hit closer to home, to focus on the human element, it’s something to be celebrated. One author who has consistently done this is James Patrick Kelly. 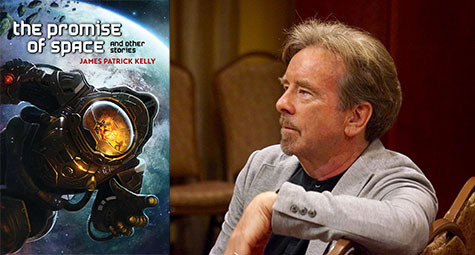 The Promise of Space is James Patrick Kelly’s newest collection of short fiction. Sixteen stories explore Dependent Intelligence (DI), the outer reaches of space, and the boundaries of technology. It’s a collection that equally highlights the breadth of Kelly’s storytelling chops and places the spotlight on his ability to create the most human of characters. James Patrick Kelly is the author and editor of numerous novels, stories, and anthologies. He has won the Hugo, Nebula, and Locus awards. He writes a column on the Internet for Asimov’s Science Fiction Magazine and is on the faculty of the Stonecoast Creative Writing MFA Program at the University of Southern Maine. His newest collection The Promise of Space is available from Prime Books this July. Probably in eighth grade—I briefly considered writing as a career, but I was certain that it was about as likely as finding a position as a freelance prince or a stegosaurus trainer. However, I wrote a truly awful hundred pages of a novel in college that lulled me into a false sense of talent and then after graduation I went to work in public relations and realized that, at the very least, I could write well enough to communicate with sanitary engineers, so why not with the rest of humanity? What originally drew you to the science fiction genre? It was certainly the combination of outré adventure with Big Ideas. While I certainly loved the Big Three, Asimov, Clarke and Heinlein, I was also a fan of weirder science fiction writers like Cordwainer Smith and Alfred Bester and more literary ones like Robert Silverberg and Theodore Sturgeon. Having written hundreds of short stories and numerous longer works, what keeps you coming back to short fiction? My short attention span? No? Okay then, maybe it’s because the short form is the most responsive to advances in the culture of science and technology and the most amenable to experiments in craft. I like to mess around with the rules. Also, when you sell a short story, you don’t have to wait two years or more for it to see print! In my early years, I was a validation junkie and wanted to know that the maximum number of readers would get to read my stuff as soon as possible. You’ve said “I think science fiction is the most important writing there is today, because it tackles the largest issues fearlessly.” What issues do you think science fiction as a genre has been tackling lately? What about you personally, in your own work? I think our notions of identity as homo sapiens is under attack from many different directions. As we learn to augment our sensorium and intervene with our genes and enhance our intelligence, the question of what it means to be human will be one that will need a thorough rethinking. Science fiction is busy, busy, busy doing exactly that and I’m all in with that effort. Also, although lots of my smarter friends might well disagree, I think we are going to have to make room in our definition of personhood for our computers and their algorithms. What inspired the concept of DI? I recall the great David Hartwell sitting on the edge of a hotel bed late at night at Somecon-or-other and advising me and a flock of my peers that it was time to rethink robots, and that my generation shouldn’t concede to Isaac Asimov the final word on this genre trope. DI is but one of the ways I’ve been trying to forestall the Singularity by imagining ways we might rein in the digital superintelligences that Google and Microsoft and Apple are busy creating. A lot of your stories feature near future tech that is completely believable. Is there a trick to extrapolate from the present? Thanks! I try! Back in the day I used to subscribe to a magazine called The Futurist, but in my experience, futurists aren’t particularly helpful when it comes to imagining tech that will change the way we eat lunch or brush our teeth or read books. To write believable tech you have to be something of a technophile. I love new gadgets and am often an early adopter. Even new tech bling that doesn’t work all that well points toward some future iteration that might do away with mice, or can openers, or socks. A few of your stories feature characters and settings that can be molded at will. They can manipulate their own appearance or their surroundings. Why does this aspect of control over the environment interest you? It mirrors the superpower that all writers share: we can build a city in a paragraph and a world in a chapter. Your new collection is full of lively and engaging characters. What is your process for developing characters? Oddly enough, I can’t really start writing a character until I settle on her name. Sometimes when a character wanders onstage I give her a name that doesn’t fit and so she doesn’t blossom into a real person in my imagination. It’s only when I lock down her name and get a proper introduction that I begin to understand who she is or might be. Also, almost all my characters act in an uncharacteristic or surprising way at some point, the action then gets subsumed into their character and makes them pop. Often this takes the form of some comic or deeply ironic wisecrack, because I like characters who make me laugh. Who is one author that influenced your writing of dialogue? Raymond Chandler is excellent for a certain kind of story. Also writing plays has really changed my dialogue technique over the years. I’m a big fan of the minimalist and absurd plays of Samuel Beckett. Do you have a different process when writing a science fiction story vs. something a bit more fantastical? Do you start from different inspirations or central concepts? Stories ambush me from many directions, so there’s no set process. A science fiction story can spring from a dream and a documentary can inspire fantasy. More than a few of my stories are in conversation with stories by other writers, either as commentary or dissent. You’ve edited a number of anthologies with John Kessel. What is your process for working together on these projects? Each was a little different. Most of the anthologies were conceived as an argument for some idea of ours, notably Feeling Very Strange: The Slipstream Anthology, which argued for some commonalities among a variety of weird and interstitial stories, or The Secret History of Science Fiction which argued that literary science fiction and literary fiction which invoked science fiction tropes occupied much the same ground. Usually one or the other of us would’ve taken the lead in defining the argument and cataloguing the kinds of stories we thought fit that definition. However, an outside observer would have been hard-pressed to discern which of us was the leader and which the follower, so often were we in agreement. In “One Sister, Two Sisters, Three” you touch on “a strain of humanism.” I’ve noticed a thread of humanism throughout your work. Is this something that has inspired you throughout your career? Humanism is founded on the notion that there is something intrinsically valuable about our thoughts and feelings and the culture and civilization that arise out of them. I do believe that is still true, but that value arises from our uniquely human perspective. However, the morality that arises out of humanism is not written into the fabric of the universe. There is no law of physics that says Thou Shalt Not Kill. This is kind of upsetting, but it makes for great stories. Interrogating the assumptions of humanism also brings one hard up against the question of who is human? When we talk about “our thoughts and feelings” who or what is included in “our”? Will aliens be, or are they by definition “not human”? Will the artificial entities that humans create be “human”? I say yes, but the proof of this is left as an exercise to the reader. As a staff member of the Stone Coast MFA Program, what is one piece of advice you can give to aspiring writers? The last pass you make on a manuscript should include a global search on the letters “ly.” You will never go wrong cutting two-thirds of your adverbs, even if you are already parsimonious with them. Also, don’t skimp on your denouements. I’m revising a novella with a science fiction circus theme, currently titled “King of the Dogs, Queen of the Cats.” And then I am going to return to the novel I’ve been crawling through for the better part of a decade in which aliens kill off all the men in order to improve the human race.